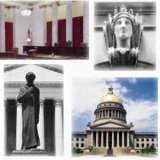 CHARLESTON, WV (HNN) – The West Virginia Supreme Court of Appeals has ruled that a special election for governor must be held between now and Nov. 15, 2011. The November date coincides with one year from the date when Gov. Tomblin took over for now Senator Joe Manchin. According to the Court’s opinion, Tomblin must issue a proclamation for a new election “forthwith.” The unanimous ruling concludes that a new election for governor must occur when at least a year remains in the unfulfilled four-year term. Essentially, the ruling supports the Citizens Action Group of WV voters who filed the lawsuit and is a setback for state Senate President Earl Ray Tomblin who became chief executive when Manchin took the seat of the late Sen. Robert C. Byrd. “We believe that the framers of the Constitution, by specifically requiring an election when a vacancy occurs in the first three years of a gubernatorial term but not requiring an election if the vacancy occurs in the final year of the term, clearly intended that a person not elected to the post may act as governor for a period of no more than one year," the ruling written by Justice Brent Benjamin said.